Well now you can find out exactly what happened when the boys in black and white played on 18th November. 9 years ago on 18th November 2006 – Injury time goals from Tommy Butler and Lee Trundle earned the Swans a 2-0 away win at Port Vale in Coca-Cola League One. 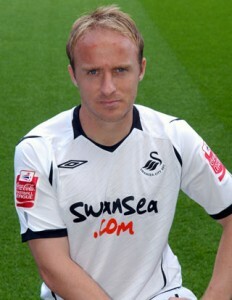 Kenny Jackett who was Swans manager at the time also handed a debut to left back Marcos Painter. 10 years ago on 18th November 2005 – A record Liberty Stadium crowd (at that time) of 19,288 saw Lee Trundle grab a brace (one from the penalty spot) as the Swans beat Yeovil 2 nil in Coca-Cola League One. The match was to be remembered for a number of reasons, from a streaker confronting the Yeovil goalkeeper to Trundle’s spectacular lob from 40 yards! 14 years ago on 18th November 2001 – The Swans put on a giant-killing show for the Sky TV cameras as they hammered Queens Park Rangers 4-0 at the Vetch Field in the FA Cup 1st Round. A crowd of 4,784 enjoyed seeing John Williams, Nick Cusack, Mamady Sidibe and Steve Watkin score for the Third Division Swans against their Divison Two opponents. 15 years ago on 18th November 2000 – AFC Bournemouth dumped the Swans out of the FA Cup in the 1st Round with a 2 nil win at Dean Court. 18 years ago on 18th November 1997 – Despite a Tony Bird double, the Swans lost 3-2 at Scarborough in Nationwide League Division Three. The Swans cause wasn’t helped with Richie Appleby being sent off for the 2nd time in 4 days and Kwame Ampadu leaving the field at half-time with cracked ribs! 26 years ago on 18th November 1989 – The Swans beat Kidderminster Harriers 3-2 away from home to knock the hosts out of the FA Cup the First Round. Goals from Andy Melville (2) and a late winner from Simon Davey spared Ian Evans’ Swans a replay at the Vetch. 37 years ago on 18th November 1979 – John Toshack’s Swans grabbed a point at home to Oxford United in the Football League Third Division thanks to Alan Waddle’s 60th minute strike. The draw was enough to see the Swans move up to 2nd place in the table. 43 years ago on 18th November 1972 – Non-league Margate beat the Swans 1 nil to knock them out of the FA Cup in the First Round. I went to Margate on the one supporters bus(half empty).I can’t remember much about the day but it took what seemed a lifetime to get there and back as it was pre M25 days.Also as I am Midlands based I have been to every game at Aggborough(some good and some woeful).I had a trip down memory lane last Saturday as I went to watch Kiddy play Aldershot.I stood with the drummer et al on the terrace behind the goal,had one of their famous £4.50 homemade cottage pies and saw a good blood and thunder 2-0 home win which still didn’t move them out of the bottom 4.A gate of 1700 or so (second best of season) with 220 from Hampshire.Like other posters have said,if the worst did happen(again) I would still be there because you have great days out with the real fans and put everything into perspective,it’s only a game. Also I had intended to have a dose of football further down the football pyramid last night.Stratford town versus Merthyr in the southern league(and maybe seen Bauza plus any other ex Swans).However the game was called off not due to the high winds but Merthyr had to play their FA trophy game that was abandoned at Hastings on Saturday(and they won 2-1. Anyway back to the present with the Swans.Massive game on Saturday and it does have a ring of the lower leagues about it as 10 years ago who would thought those teams would be fulfilling a fixture in the Premiership.Lets hope we are not fulfilling this fixture in division 3 in another 10 years time but if it did happen “I’ll be there!